New content is posted on THE BLOG. : (colons) : denote "Intro" pages, full of background information on the respective blog category. * (asterisks) * denote NON-blog category pages. You have found your way to a unique, multifaceted Web site / blog, some parts of which may delight your senses and edify your mind, while other parts may confuse or offend you. Links to each of the major sections of this site are on the left; roll over those links to get a quick "preview" of each one. This site has been under development for ages and ages, and there are always a few messy details to fix up and always something new for curious minds. Please stop again for a visit! The central blog (Web log) page brings together comments on all topics. Note that the Academics and Photo gallery pages toward the bottom are not Web logs and thus not frequently updated. 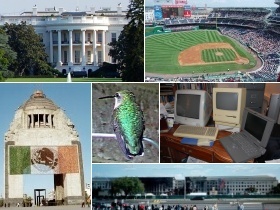 Photos (clockwise from top left): the White House; Nationals Park; "retired" Macintosh computers; the Pentagon in October 2001; Revolutionary Monument in Mexico City; and in center, a Ruby-throated Hummingbird. Featuring a comprehensive set of original baseball stadium diagrams and photos, and tables of comparative data, with blog commentary focused on the Washington Nationals and New York Yankees. Dedicated to the proposition that baseball plays a unique role in overcoming social distrust and uniting our fair republic. Photos (clockwise from top left): Nationals Park (Washington); Yankee Stadium II (New York); Busch Stadium III (St. Louis); Coors Field (Denver); Citi Field (New York); PNC Park (Pittsburgh). Featuring chronologies of U.S. presidents, Supreme Court justices, foreign leaders, etc., with blog comments focusing on prospects for restoring a limited-government republic and rebuilding civil society. "Can we all get along?" Photos -- Top row: the White House, and a group of "Tea Party" protesters at the Staunton July 4 parade. Middle row: Creigh Deeds, Bob Goodlatte, Bob McDonnell, Bill Bolling, and Dickie Bell. Bottom row: Ben Marchi, Scott Sayre, Ken Cuccinelli, and George Allen. Featuring background information on the political situations and recent history of all twenty nations in Latin America, along with other pages with comparative data, with blog commentary focused on Peru and the Andean region. Photos (clockwise from top left): Revolutionary Monument in Mexico City; Machu Picchu ruins in Peru; pyramid at the Tikal ruins in Guatemala; Plaza Murillo in La Paz, Bolivia; Sandinista monument in Managua, Nicaragua; and painted ox cart in Costa Rica. Featuring pages with war chronologies, comparative data on military affairs, and war games ("conflict simulations") in various stages of completion, with blog commentary focused on the wars in Iraq and Afghanistan. Photos (clockwise from top left): Vietnam Memorial in Washington; B-24 Liberator bomber from World War II; National Guard troops in Staunton, VA departing for Iraq; the Pentagon in October 2001; Civil War battlefield in New Market, VA; and in center, D-Day Memorial in Bedford, VA. Featuring past records of annual bird arrivals, with blog summaries of recent observations of wild birds on field trips with the Augusta Bird Club, with others, at home, or alone. Photos (clockwise from top left): Bluebird, Tree swallow, Ruby-throated hummingbird, Cardinal, Magnolia warbler, Barred owl, Painted bunting. The amusing escapades of our friendly and inquisitive canaries -- Oliver, Daisy, and their SIX (!) offspring -- as well as fond memories of the ones who are no longer with us. Photos (clockwise from top left): Kate; Duke as a hatchling; Daisy feeding Duke & Kate; Oliver feeding Pavarotti, Handsome, Precious, and Lucci; and the latter four just after they fledged. The "residual" blog category, with everything from pop culture to music to religion to lengthy travelogues to brief reports on day trips here and there. Photos (clockwise from top left): Blackfriar's Theater in Staunton, VA, home of American Shakespeare Theater; sculpture by Alexander Calder in Chicago; engraved stellae at ruins of Copan, Honduras; Lutheran church near Richland, SD; folk musicians in La Paz, Bolivia. Focusing on Macintosh computers and other Apple-related topics, space travel, astronomy, and the "paradigm shift" of Chaos Theory. Photos (clockwise from top left): Delta, Titan II, and Atlas rockets at Cape Canaveral; nuclear power plant in Ohio; Toshiba pocket radio/cassette player; Apple iMac, Macintosh Plus, and PowerBook computers; and the full Moon. A summary of my academic research work and teaching positions, with a short synopsis of my dissertation, philosophy of teaching, etc. Photos (clockwise from top left): The Rotunda, Univeristy of Virginia; Hunt Hall, Mary Baldwin College; Wilson Hall, James Madison University; Gray Hall, Sweet Briar College; Burruss Hall, Virginia Tech; and the old U.Va. Cavalier logo. A copious gallery of photographs from near and far. Photos (clockwise from top left): Mushroom; an elevated view of Machu Picchu, Peru; country road in South Dakota ; Scarlet Tanager; Tiger Swallowtail butterfly (female dark morph). It's all about me: Personal beliefs, tastes, experiences, peculiarities, and idiosycrasies, formerly contained on this page. Photos (clockwise from top left): Graduation Day at U.Va., May 2002; at Machu Picchu, Peru, March 2004; with Jacqueline at Humpback Rocks, June 2010; at Yankee Stadium (the original one), October 2008; musical event at church, March 2009; way wayward Western Tanager, March 2002; Mount Rushmore, South Dakota, August 1998.